...the playing had great delicacy and poise... beautifully executed... considerable range of tone colours. The advanced techniques required in the flute part were managed successfully and both players conveyed the spirit of the piece and their own enjoyment of it. - Pan (The British Flute Society Magazine). Flutist Anne Allen has performed recitals for many concert societies and private gatherings, including performances with Roger Vignoles, Charles Matthews, Christopher Taylor, Yeu Meng Chan, and singers Katherine Jenkins and Hayley Westenra. These usually take the form of flute and piano, flute and harp or flute and guitar duo recitals but Anne performs with various chamber groups. Most recently Anne performed with Charles Matthews and Roger Clayden in the 60 Minutes of Music Friday evening recital series at The Regis Centre, Bognor Regis. Later in May 2014 Anne will be performing a programme of South American music for Shipston Music Society with Charles on piano and Keith Price on percussion! This was the best concert I ever heard in this house" was stated independently by two members who have been coming for more than 30 years. Thankyou Anne and Chris. - Udo Bauer, Secretary, Schubert Society of Britain. Other requests can be happily accommodated. When we have all this information we would be delighted to give you a quote. 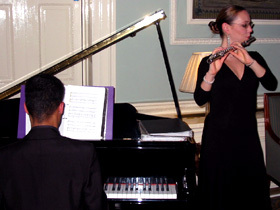 Packages start from £500 for a duo recital. Anne has an extensive repertoire list available and will happily include any requests. The music is chosen with consideration of the audience and is therefore tailored to each individual booking. The wide repertoire Anne can provide spans light classics, popular music and more formal repertoire. A more recent venture of Anne's is providing themed evenings of entertainment, for example an evening of French Favourites, with food and wine to match! A repertoire list is available on request and a selection of demo recordings can be listened to if you click here. Please call 07779 099210, or email your queries. A brilliant display of technique and musicianship...theirs is a duo par excellence... They communicated the love of the music so readily.